If you are shipping product out of the warehouse and wish to simply record this fact without going via the more formal channels of creating truck runs, you can perform a manual ship. 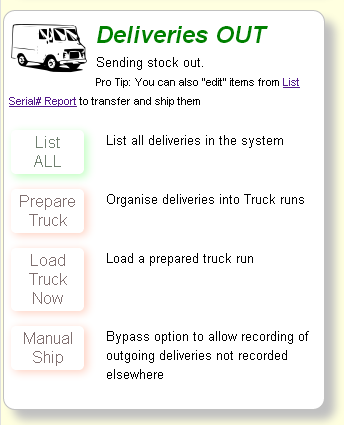 From the stock dispatch menu screen, select "Manual Ship" from the Deliveries out box. Make sure your store name reflects where you are. This should already be set to your current location. 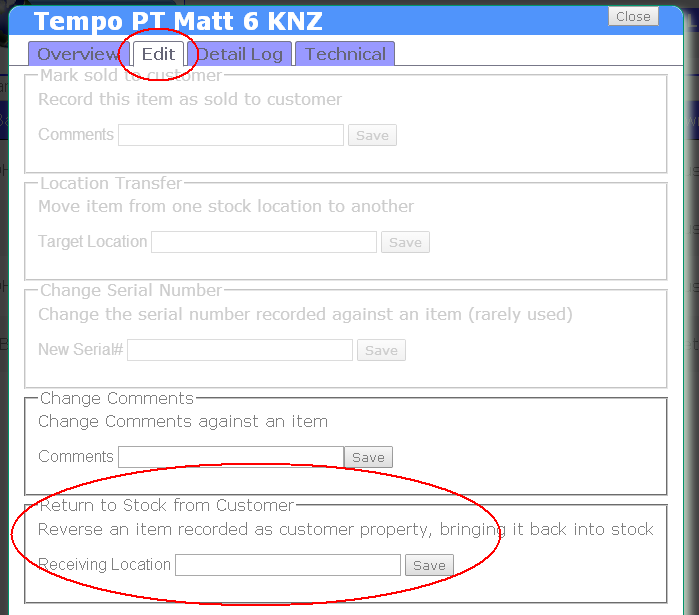 When a valid "in stock" barcode is scanned, it will immediately be recorded as "shipped to customer"
If you make a mistake on this screen, you need to use the "Transit list" report and edit the product. You cannot undo scanning on this screen. From the stock dispatch menu screen, select "List Serial#s" from the "At the Warehouse" out box. Search for the exact item you wish to ship. Click on the row detailing the item to select it. A popup window will appear with more targeted information about this individual item. Select the edit tab, and there is an option to "mark as sold to customer". Complete this option and press save. If items return to the warehouse from customers, or from deliveries that did not happen, the system needs to be updated to reflect the item returning to the warehouse. The method shown here is only recording physical stock movements, it is not applying financial adjustments. Once you have found the item, click on the row to display full details. Select the edit tab. On the edit tab there is an option at the bottom to return items to stock. You must select the location receiving the stock and press save.